The Institute of social sciences and humanities – Skopje invites you to the two-day encounter and exchange of regional theory, activist and art practices. AUTONOMY/LIBERATION is the first event of the regional collaborative project NATIONLESS, a common effort of the Institute of social sciences and humanities – Skopje, DAM-DAŠ/ Škart – Belgrade and the University of Macedonia-Thessaloniki - Department of Balkan, Slavic and Oriental Studies. 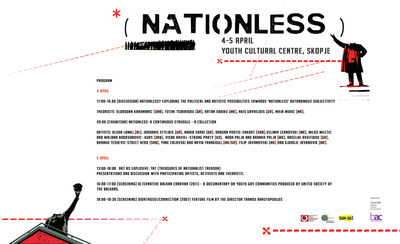 The project NATIONLESS aims to open a space for artistic intervention, thinking and re-thinking the particular issue of nationalism and its social reproductive power with a specific focus on the broken communication and a virtually complete lack of collaboration between regional artists and intellectuals. However, it does not seek to overcome the mere problem of lack of communication but rather, through an artistic undertaking, to challenge competing nationalisms in the different countries through artistic-political and theoretical explorations of the idea of "nation". The political status of "nationality" is the main pillar of all other political and social categories and processes in these three countries. It determines the cultural capital of nationhood and national origin which further influences the economic processes and possibilities of social mobilization and solidarity. Therefore, this project seeks to problematize national(ist) identity politics that are ‘inclusive’ for some, and always ‘exclusive’ for the others and paralyzing of all politics that debunk the sanctity of the ethnic principle of social mobilization. The project represents a counterweight to the current political tendencies by engaging grassroots actors to tackle the social consequences of the mainstreamed nationalism. The project presents an innovative and cross-disciplinary approach to devising tools developed throughout the production process and which represent a contribution to the general contemporary praxis in art and theory in the Balkan region. These tools are open to further reapplication, modification and adaptation, thus enabling a new transformative praxis to take place on the basis of this project. Theorists: Slobodan Karamanic (SRB), Fotini Tsibiridou (GR), Artan Sadiku (MK), Akis Gavrilidis (GR), Maja Muhic (MK). Artists: Olson Lamaj (AL), Iordanis Stylidis (GR), Maria Sarri (GR), Dragan Protic – SHKART (SRB), Visar Arifaj – STRONG PARTY (KS), Nada Prlja and Branko Prlja (MK), Angeliki Avgitidou (GR), Branko Teshevic – STREET HERO (SRB), Yane Calovski and Nayia Frangouli (MK/GR), Filip Jovanovski (MK) and Gjorgje Jovanovik (MK). Presentations and discussion with participating artists, activists and theorists. 16:00 – 17:00 [Screening] Alternative Balkan Caravan (2011) - a documentary on youth gay communities produced by United Society of the Balkans. In order to fight for the rights of a community, first you have to identify these rights and then to inprint them. This exact depiction, we set as a target for 2011 and furthermore decided to do it by using multimedia and art. This way it was given birth to the idea for the creation of a documentary which would present the life and status of the homosexual, bisexual and transexual rights in Albania, Serbia, Bulgaria, Rumania, Greece and Turkey. A man gets out of prison. Like a modern Ulysses he undertakes a homeless journey into contemporary Athens, populated by migrants, homeless and other marginalized people. On his way he meets a woman and a little girl. Are the three of them members of a disrupted family or just persecutors and victims of a violent conflict driven by society that prevents them from living together? We want to thank ArtAngle – Balkans for their support of the NATIONLESS project. ​The international partnership project Beznacionalnost/NationLESS of the Institute of Social Sciences Skopje (Skopje), the University of Macedonia -former School for Theory and Industrial studies( Thessaloniki), Edition Yugoslavia (Belgrade) will be presented at the Museum of Yugoslav History on 20 June 2015, from 11 a.m. to 8 p.m. The project gathers artists and theoreticians who question the idea of the identitarian signifier nation. The day-long project consists of an exhibition of works, screening of film fragments, polyphonous reading of thematic poetry and the interventions of participants from Skopje, Thessaloniki, Belgrade and the region. The period after 5 p.m. is reserved for the interventions of Edicija Jugoslavija collective: Yugoslav Revolutionary Subjectivity: People ≠ State, by theoretician Slobodan Karamanić (Zrenjanin, Belgrade, Ljubljana, Munich), followed by the short presentation of a talk which will be fully persented in Skopje:Yugoslav surrealism/ yugoslav surnationalism: eyesight root of People Liberation strugle, by Ivana Momčilović, playwriter (Brisel, Beograd). Taking into account the primordial violence that lies at the heart of each politics of identity, which in order to "include" someone, always excludes someone else, the Belgrade variation of the Beznacionalnost/ Nationless project held on the route Skopje-Thessaloniki-Belgrade, calls for the conceptualization of the horizon that could be thought as exceeding the mono-identitarianconcept of the bourgeois Nation-State, offering a refracting perspective of "the street and the backyard" of contemporary identities. Trying to think the possibility of emancipation through and outside the framework of national awakening waves of the bourgeois State (19th century), this project raises the question of relevance of an identitarian void. Can the concept of a void which in astrophysics represents matter par-excellence become the starting point of a new materialistic fiction of an emancipating supra-identity, a conceptual “split” that would bridge, by an uncertain balance at the beginning, the discrepancy caused by rhythmical convulsions of correlate belonging: national and nationalistic, identitarian and atavistic; restricting and always segregationistically dividing? What would this new step be? Word, image, movement are given to the poets, theoreticians and visual artists of the region. Edition Yugoslavia and the Škart Group as conveners of the Belgrade gathering focus on the example of Yugoslav exceeding of European "modernist" aspirations at the moment of creating a wide identity Yugoslavia in the National Liberation Struggle in 1941 and the example of poetics and politics of Yugoslav surrealists, calling on the participants and partners to present their local subjects of research. Set of reflexive meetings between researchers and activists in art and theory. After welcoming friends from Kosovo, Pristina, Belgrade, Skopje and Tirana, we will alter the images of the created artworks already been established during our meetings in Belgrade and Skopje. Further more, we will promote our dialogical approach among artist and architects, researchers in humanities and social sciences. We are aiming to liberate thoughts and build new vivid social bonds that can reform the public space. 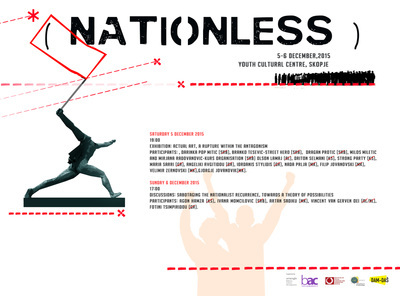 ​Artists and theoreticians from Macedonia, Greece, Albania, Kosovo and Serbia will meet in Skopje at the Youth Cultural Centre on Saturday and Sunday (5-6 December) for an exhibition and conference named Nationless / Actualization, organized by the Institute of Social Sciences and Humanities - Skopje to confront and exchange of the regional theory, activism and artistic practices. This is the last in a series of events of the project Nationless. 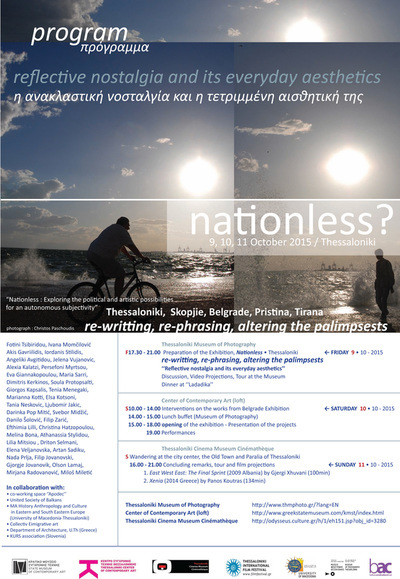 The event will engage theoreticians and artists in visual and narrative explorations of the possibilities of the interplay of artistic and theoretical production in the Balkans towards opening of new fields of contestation, reconfiguration and actualization of liberation/autonomy beyond the nationalist production of subjectivity. On Saturday, 5 December at 20:30 pm in the gallery of the Youth Cultural Centre there is an opening of the exhibition Actual art, a rupture within the antagonism with participation of Dragan Protic, Branko Teshevic, Darinka Pop Mitic, Kurs Organization, Olson Lamaj, Driton Selmani, Visar Arifaj, Iordanis Stylidis, Angeliki Avgitidou, Nada Prlja, Filip Jovanovski, Velimir Zernovski and Gjorgje Jovanovik. On Sunday 6 December at 17h in the gallery of the Youth Cultural Centre there will be a discussion entitled Sabotaging the nationalist recurrence, towards a theory of possibilities with participation of Ivana Momcilovic, Artan Sadiku, Agon Hamza and Vincent van Gerven Oi. After the first event Autonomy / Releasing held in April in Skopje at the Youth Cultural Center, Nation /emanations held in June in Belgrade at the Museum of the History of Yugoslavia, Reflective nostalgia and its everyday aesthetic held at the Museum of Contemporary art in Thessaloniki, Actualization is the fourth and final event of the project Nationless, joint work of the Institute of Social Sciences and Humanities – Skopje, Dam Dash- Belgrade and the University of Thessaloniki - Department of Balkan, Slavic and Oriental Studies.